We went around the top 15 terraces, which offer the most breathtaking views, and made a list of places to look this season. The new design hotel Renaissance Downtown hotel, Dubai has already opened a lot of good restaurants: French Bleu Blanc, the new project of the famous chef David Myers, fusion of Western and Eastern cuisine in the incredible Morimoto (wait for a separate review), stylish Italian Basta... each of the restaurants is worth a look. But now is the time to visit BHAR, which is located on the third floor of the hotel. 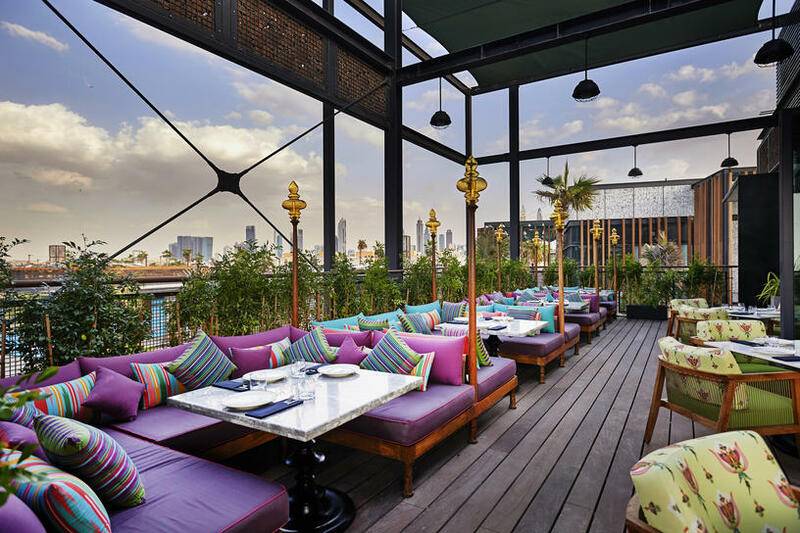 The middle Eastern restaurant-lounge with an outdoor terrace is particularly good in the evening hours at sunset. 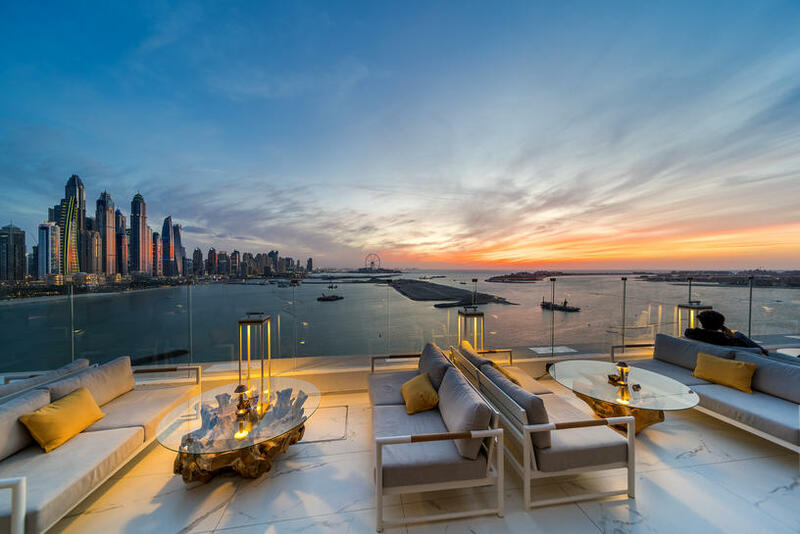 In June of this year, the Address Downtown hotel finally opened its doors again. The 63-storey hotel has 220 rooms and apartments, a new SPA, several new restaurants and updated versions of our favorite places that worked in the hotel before. The restaurant's signature restaurant, lobby lounge, Cigar Lounge, bar on the top floor of Neos, Turkish the Galliard, Japanese Katana and American STK Steakhouse have already opened, and California fusion restaurant Zeta opens in November. The views from almost all places are breathtaking, including the Club Lounge terrace. 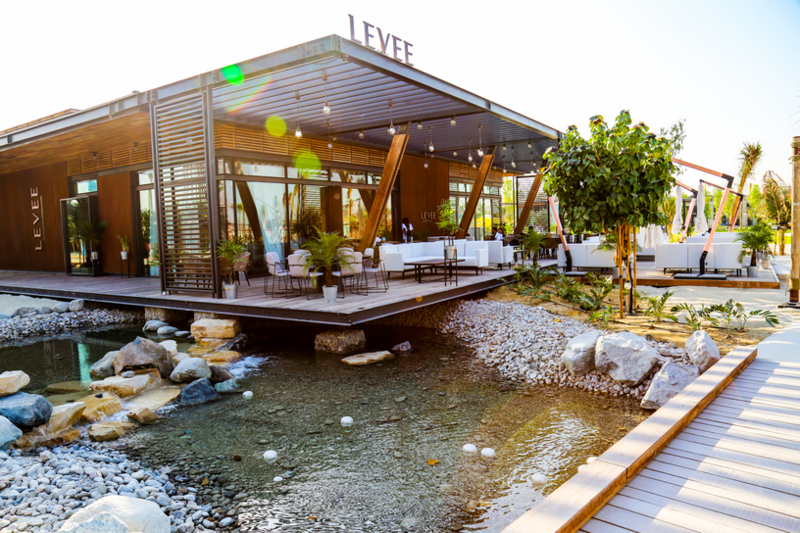 A brand new place Eve – a restaurant on the roof of the Hyatt Regency Dubai Creek Heights. 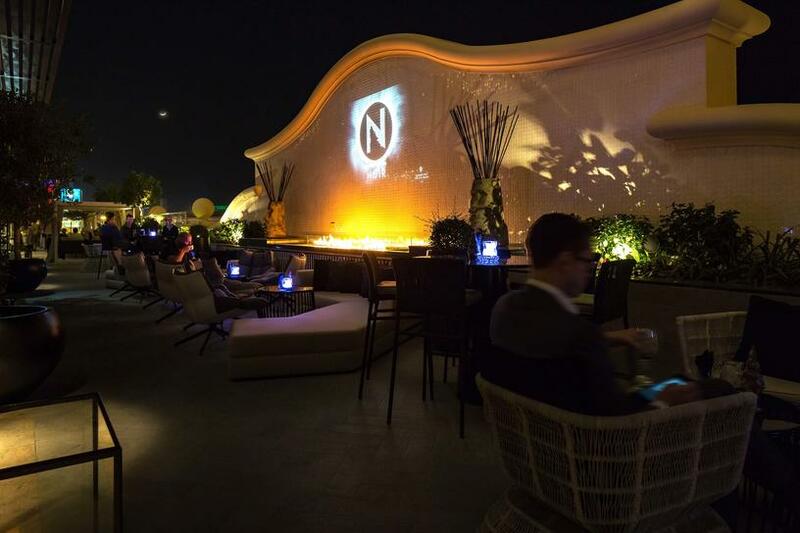 The terrace offers panoramic views of the whole of Dubai, and here often look many trendsetters of the city for good photos. Here you will find both classic luxury and modern HYIP. On Thursdays there are theme parties in the style of "the Great Gatsby". The penthouse opens daily at 16.30. 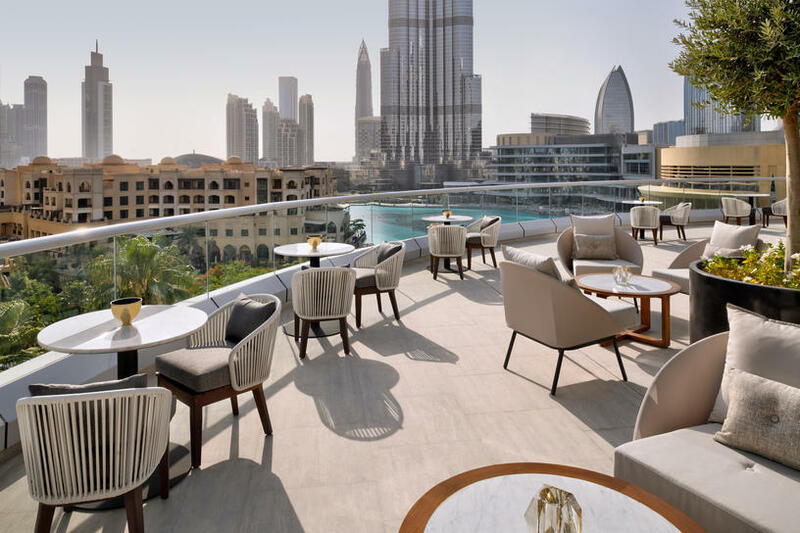 Plus to the gorgeous view of the Bay with yachts and the Burj Khalifa on the horizon, in Brasserie Du Park waiting for a pleasant live music. Every Thursday there are performances of the singer from the UK Claudia Patrice ("Soulful Nights"). During her career, she has worked with Kylie Minogue, Chuck Khan and Simple Minds. The music is soft and unobtrusive, it creates a light mood and sets the tone for the weekend. As for the menu - the Italian Daniele Gialluisi, who previously worked in the kitchen of Palazzo Versace, is responsible for it. International experience gained in working with Michelin chefs, he brings to the creation of dishes in Brasserie Du Park. Especially recommend the burrata and a pizza with truffles. Although, there tasty all. 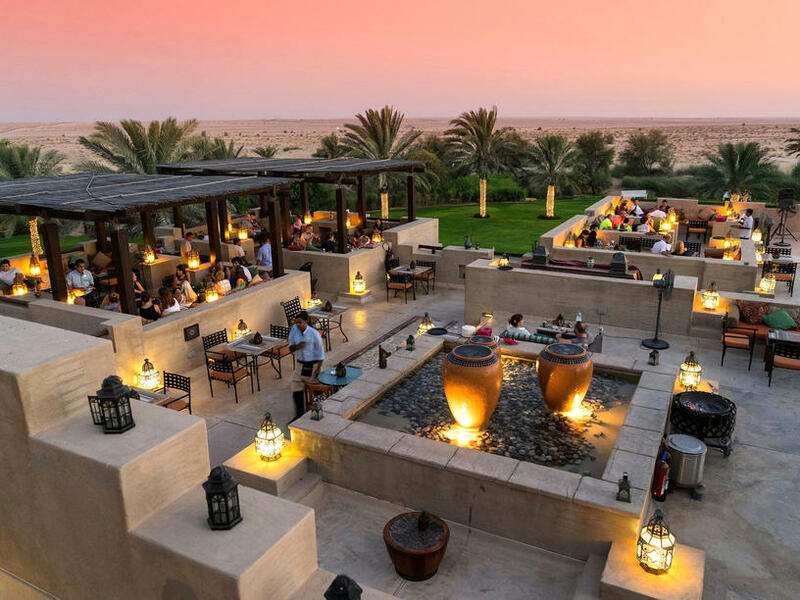 Al Sarab is a two-storey rooftop lounge with an authentic Arabian atmosphere and views of the Arabian desert. After sunset, the bar is transformed: the lighting is dimmed, and guests can enjoy an evening with traditional live music and thick flavors of hookahs. So the evening was a success, at Al Sarab the Arab singers are invited. The place is famous for its cozy interior in Oriental style, comfortable sofas and carved Arabic lanterns. Perhaps you know The Penthouse as a place where the most fashionable house-parties in the late evening on Thursday or cheerful Ladies Nights on Saturdays – but in addition it offers a magnificent view of the city, the Palm and Dubai's incredible architecture so in the bar you can just sit with a glass of wine after work. 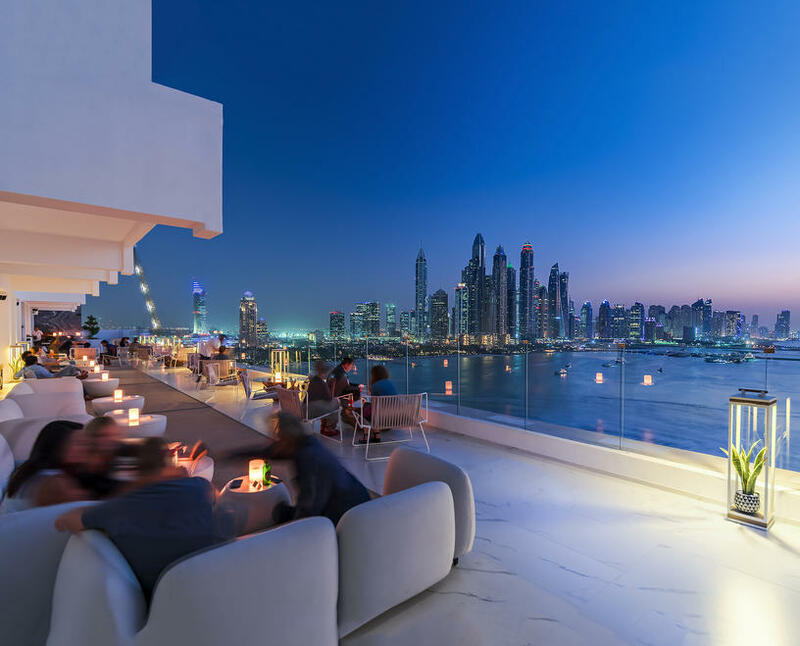 The Penthouse Dubai is located on the 16th floor of the FIVE hotel-a club and evening lounge for adults only, as well as two swimming pools with glass bumpers. The perfect place to relax, dine and enjoy life. The new Mediterranean restaurant in La Mer boasts its own pastry shop and direct sea views. The lunch menu (available all day) is based on seasonal ingredients – so all meals will be fresh and tasty. The menu was developed by chef Chandima of Alavita, who previously worked at Vida Downtown, so the restaurant promises "home cooking from the heart" and a beautiful flow. The interior is designed by the Dubai company Innovate Living and designed in the style of new York lofts. The target audience of this bar, lounge and restaurant (three in one) are cosmopolitans from all over the world. An unusual concept for an Indian restaurant – but Masti comes out of the plane of one country and combines all the best achievements of the hospitality industry. "Fun and pranks" - roughly so with Hindi translated word Masti. This is the first licensed restaurant in the area of La Mer. The terrace that meanders around the restaurant is a kaleidoscope of flowers: lime, sea blue and fuchsia, surrounded by dense greenery and vegetation. All this creates a modern and bright atmosphere. Provocative cocktail bar and lounge on the 2nd floor of Kempinski Mall of the Emirates – is the maximum of decadence and elegance. Mixologists will seduce you with stylish glasses with complex cocktails. Signature service and a good selection of Havana cigars in the hypnotizing VIP Blue Room attracts special guests. 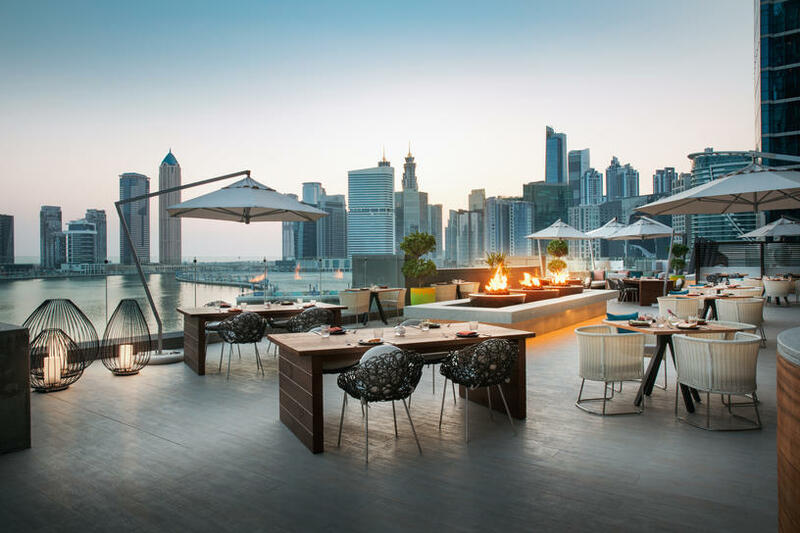 The terrace offers views of Dubai's scenery. At midnight on Fridays brunch starts here-unlimited portions of pan-Asian and Latin American cuisine and specialty drinks and cocktails. And on Thursdays, from 20.00 to midnight, the girls are going to the Ladies Night. 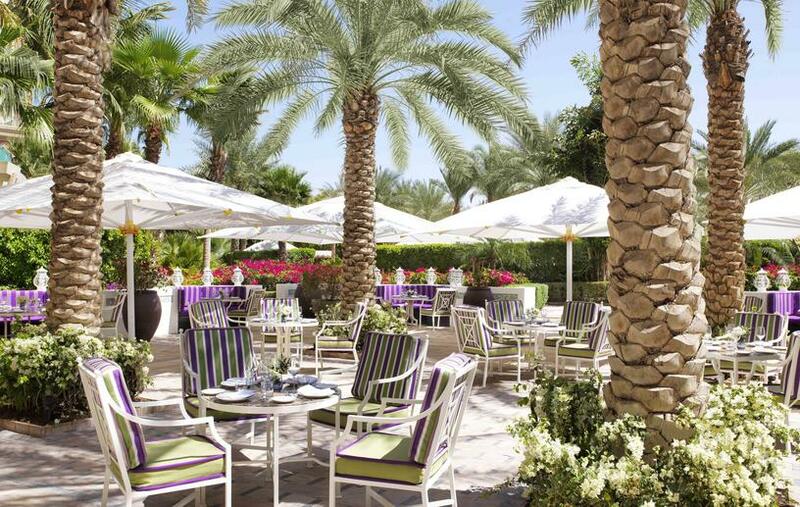 At the Fairmont the Palm's SeaGrill, we recommend a stop at brunch on Friday. Food is served here for company, so guests can only sit back and watch the waiters bring an incredible selection of specialties - from snacks to desserts. The very snack of fresh oysters, lobsters, mussels, scallops and octopuses served on a beautiful tray with ice and flowing smoke. Followed by a second appetizer of salad with boiled octopus and crumble with foie Gras. Entrees include chicken, fish with pasta of calamarata and mushroom fusilli with goat cheese and truffle oil. A dessert consists of 4-5 different types of cakes and ice cream. The ideal place to gather with friends and have a great time in a relaxed atmosphere. 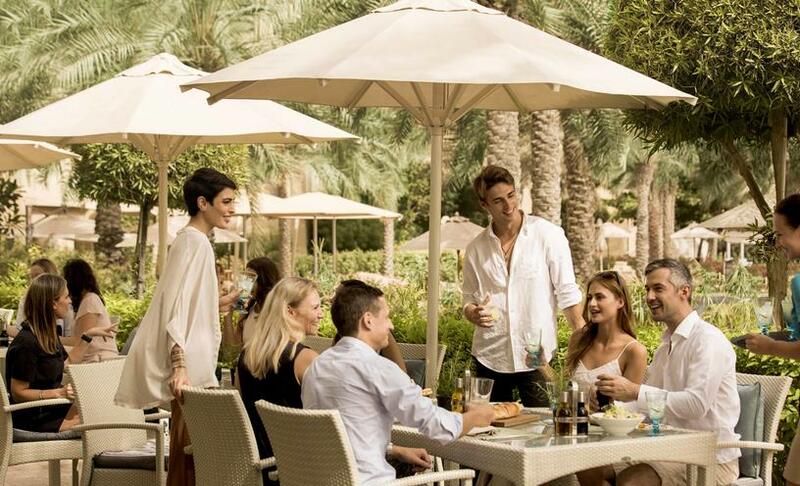 The brunch price is AED 345 per person with soft drinks and AED 495 – with alcohol. After brunch followed by happy hours (from 16.00 to 18.00), and you can go to the floor above, in Ba Restaurant and Lounge. In 2018 Enigma Dubai restaurant presented a new concept - "taste of Persia". The menu was Michelin-starred chef Mansour Memarian, who had worked in the restaurant Al Mahara in Burj Al Arab. The Palazzo Versace team says the next concept is "an intriguing look at the Persian culinary tradition." 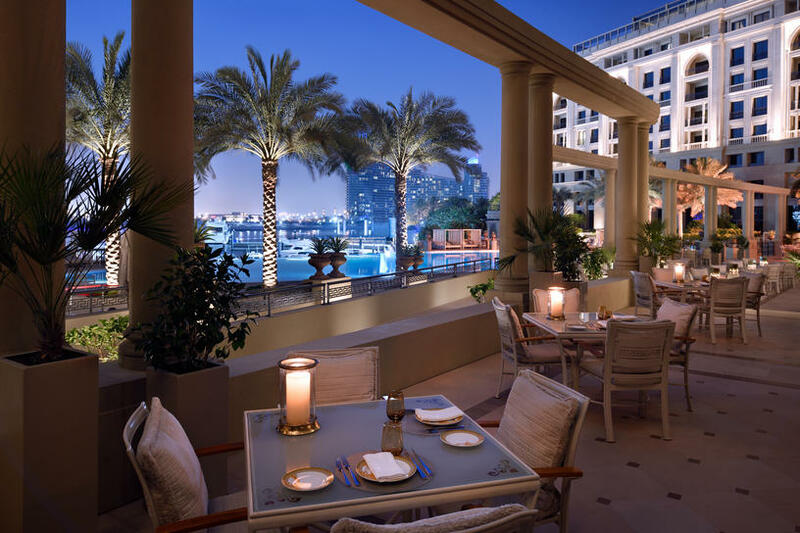 In winter, you should book a table exclusively on the terrace overlooking the Dubai Bay. Light snacks, beautiful views and soft sofas next to burning torches. 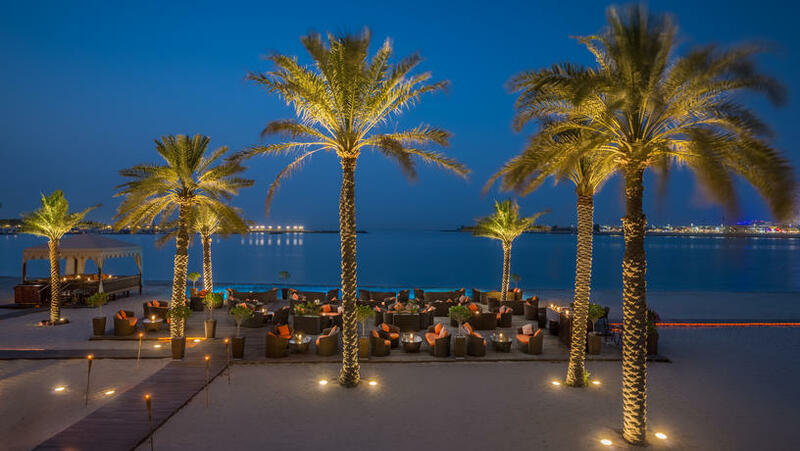 The open-air lounge on the beach at the Emirates Palace Abu Dhabi is a great place to catch a glimpse at sunset or just after dark. 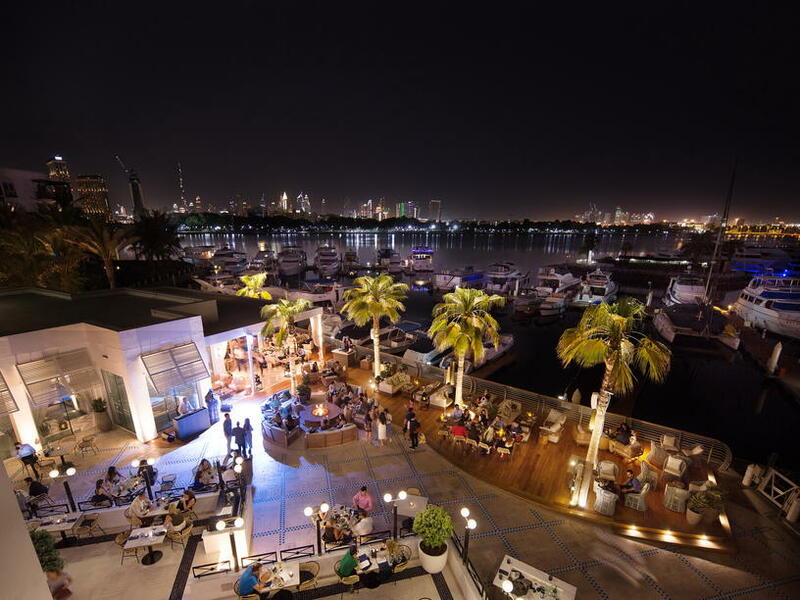 You can rent the hookah and slowly watch the magnificent yachts sparkling in the Marina and a night Arabian sea. In whatever direction you look-at the glittering Emirati Palace with its vast territory or the Persian Gulf – everywhere will be beautiful. A good bonus is a refreshing sea breeze and aristocratic atmosphere. The restaurant is located in Atlantis the Palm, and its interior is as luxurious as the hotel itself: white-blue-black geometric patterns, a wide staircase, soaring up, an outdoor terrace, which is so nice to dine in the winter. In the open courtyard you can sit on comfortable chairs with cushions to live Oriental music or order a hookah. Arabic food is traditional, but incredibly tasty. We should also note the dishes – maybe the best in the city: white ceramic bowls and plates with lumpy edges. Perhaps they create a homely atmosphere in the restaurant. Attention should be paid to the local hummus – it here is special. Delicate, creamy aftertaste of hummus from Ayamna you will remember for a long time. It is served with warm hubz cakes – fresh, soft and lush-which are baked right in the restaurant. 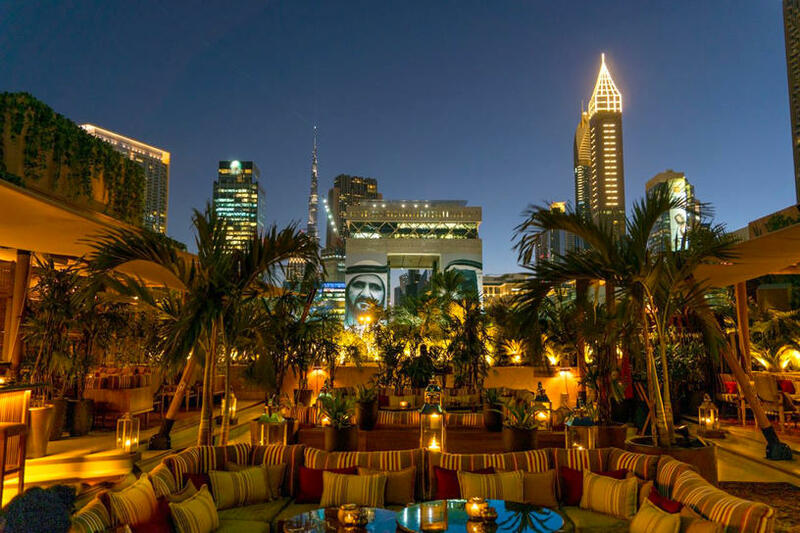 This restaurant-lounge is located in the heart of the city, but at the same time as if in the middle of the desert – this feeling is born in Ninive in Jumeirah Emirates Towers. Local chefs interpret the culinary traditions of the East in the menu and invite you to travel through time. The restaurant immerses in the atmosphere of an Oriental fairy tale, besides it serves hookah. It owes its name to the ancient city of Nineveh, the capital of Assyria. It was there, according to one version, spread Hanging gardens of Babylon. Did this mysterious place really exist, or is it a figment of fantasy? In any case, being in Ninive, I want to believe in a fairy tale. 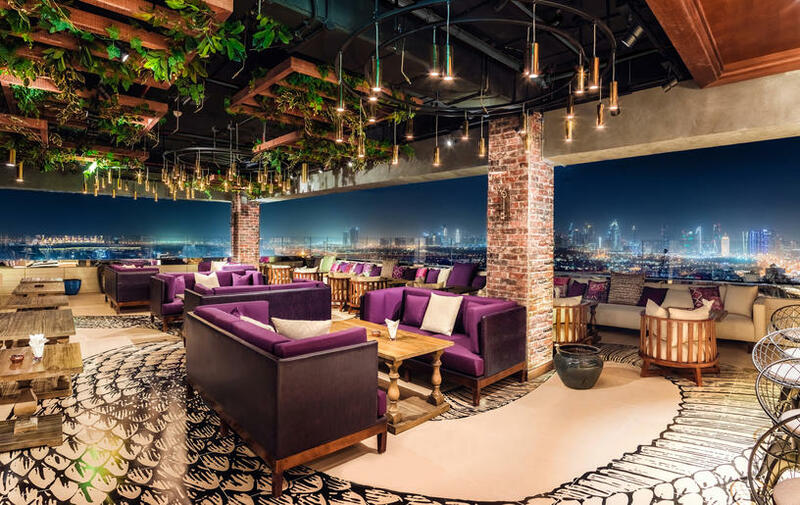 Folly by Nick & Scott has already received the Time Out Dubai award for "best bar with a view 2018" and "best club venue 2018" from the Middle East Hospitality Awards. So the place is really decent. 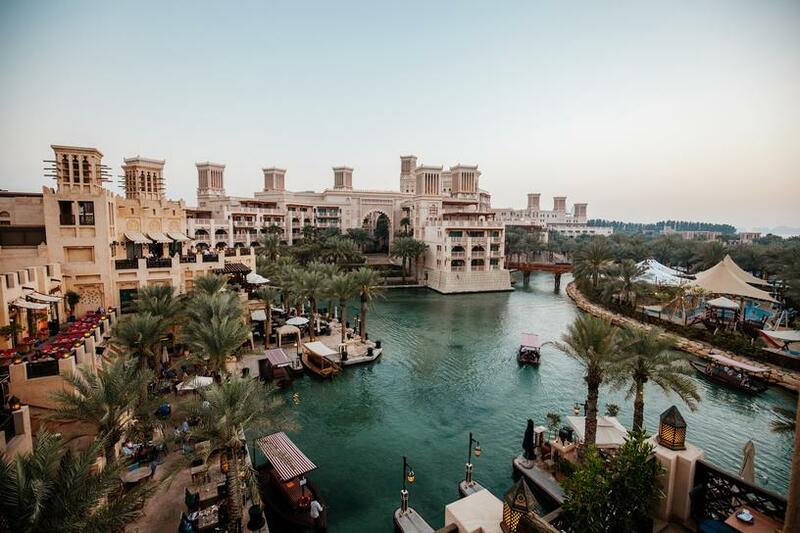 The view of the canals of Madinat, the Persian Gulf and the Burj Al Arab, everything is beautiful and tasteful. It's good to sit at sunset and leisurely drink a cocktail, at the same time making win-win pictures for Instagram. Every Tuesday, Ladies Nights are held from six in the evening until three in the morning, and Sundowners (gatherings with wine at the end of the working week) – every Friday from six in the evening.